Is the Emergent Church evangelical? 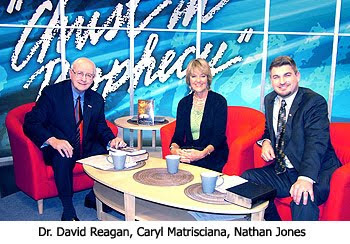 Dr. Reagan: The Bible prophesies that in the End Times Christianity will come under increasing persecution. That prophecy is being fulfilled today. All across the world millions of Christians are being verbally abused, physically harassed, and yes, even murdered for their faith. But, these attacks as terrible as they may be are not the greatest threat to the Church. The greatest threat comes from within the Church in the form of Apostasy. Nathan Jones: With that in mind, let's start our discussion with talking about the health of Evangelical Christianity today. When I was little and growing up the word Evangelical meant you went to the Bible for your faith to learn what was true, but the word Evangelical seems to be losing its meaning in this day and age. Would you agree? Caryl Matrisciana: Absolutely! We are living during what's called the Post-Modern Era or Post-Modern Culture. The Post-Modern philosophy teaches that there are no absolute truths. This goes against the original, traditional evangelical thought that the Bible is the inerrant Word of God. Jesus said in John 14:6, "I am the way, the truth and the life," but now the Post-Modernist is teaching that truth isn't actually knowable. This is an Eastern worldview. In Eastern Mysticism truth is all embracing. Truth is that your truth is good for you and my truth is good for me and in order for the two of us to unite we must dialogue and converse. Well, we know what happened in the Bible with the first conversation, right? The first conversation was with the Serpent and Eve. She was without sin and pure, made in the image of God. Satan came and tempted her with an extraordinary desire that she could be even more like God, though she was already without sin. Well, what's been happening within Christendom today is that we are also being told we can supposedly become more like God through Eastern Mysticism. Satan used Eve's reason and her imagination. The fruit looked like it was good to eat. So, all of these concepts of dialogue and conversation have come in where we are talking about each other's opinions all being equal. Opinions are nothing, though, as it's God's opinion only that counts. If God says that evil is evil and good is good then that should be our Evangelical Bible believing standard. Nathan Jones: So, we have given up the Bible then as our source of truth and turned to ourselves as a source of truth? Caryl Matrisciana: Yes, though conversation and dialogue we reach a consensus of what truth should be. For example, we bring in a crisis situation and then you dialogue about it and meet somewhere in the middle. It is a sort of synthesis. You bring in the idea of "let's all get together and try to solve this solution." The problem with this methodology for defining truth is that if you are with a Muslim and a Hindu and a Christian and you are all trying to dialogue about sin, there will be no meeting place if you are going to stand on biblical truth. For example, in order for us to bring in what the Bible says will happen during the last days concerning the institution of a one-world religion, we've got to be able to merge all our ideas and remove Jesus as the deity that the Bible says He is. Instead, we will claim we can become the deity, in others words, we can define our own truths. So, a Muslim can define his Allah as being the same as let's say what the Bible describes as God, though they are very much not the same as the Muslim's God is the ancient moon god you see on top of every mosque in the form of the crescent. Dr. Reagan: The Emergent Church Movement seems to me to be one of the most dangerous movements in America today because the leaders of it claim to be evangelical. They have using that claim been able to infiltrate evangelical seminaries and evangelical churches. I see them showing up at the most conservative denominations in America making their presentations. And yet, these are people who deny absolute truth. The Bible has absolute truth, but they say that it does not. They deny that. Instead, everything gets into touchy-feely based on emotions rather than what the Bible teaches. One of the things that the Emergents are doing is getting back to mysticism. For example, I know of a major evangelical church where the pastor came in and said, "Okay, from now on we are going to have card tables in the lobby. On each card table will be a Greek icon and there is going to be instructions about how you can kneel and pray to the icon. Now, this is an "evangelical" church! Caryl Matrisciana: Absolutely, that's the idea of ecumenical discussion. It's conversation with those who perhaps don't believe in your same faith, whether they are those from other religions or who also claim to be Christians. They wonder how can we bring all Christian denominations together under the same consensus beliefs. Dr. Reagan: A lot of it seems to be getting back to the touchy-feely stuff that was characteristic say of the Roman Catholic Church in the Middle Ages. It's the idea of you've got to have incense and you've got to have other visuals of that nature like candles and so forth. The thought is that these items will all draw you into a deeper relationship with God. It becomes very mystical. Caryl Matrisciana: This new spirituality is mysticism. You see, when you don't have a relationship with the Lord Jesus Christ and a relationship with God through the Lord Jesus Christ, there is a vacuum in you. You will try to fill it by having a mystical experience. We are made to have a relationship with God. When you have a relationship with lying spirits and the doctrines of demons, how can we know that true relationship with the Father? You have to know the Bible in order to test the spirits, which we are told to do in the Scriptures. But, if you don't have the living sword, the two-edged sword, the testing ability, then the experience that I feel is my experience and it feels like a good experience and it is a spiritual experience, but it is not the right experience. I know having come from the New Age that mystical feelings are very powerful. They feel very real and appear to be truthful, but they aren't the truth. Nathan Jones: Those who seek consensus of truth would just slap a bumper sticker on their car that says "Coexist." Dr. Reagan: Brian MacLaren, the recognized leader of the Emergent Church Movement, recently appeared at a very conservative college here in Texas. I wrote the President of that college and I gave him two pages of MacLaren's quotes such as, "Homosexuality, what difference does it make?" That is his attitude. "Absolute truth, no there is no such thing." He went on and on and so I gave quote after quote after quote. I asked, "You are going to have this man speak to your people? This is a wolf in sheep's clothing!." He wrote back and said, "Well, I don't really know anything about him. The Chairman of our Bible Department arranged this. I will have him write you." The Chairman of the Bible Department replied to me by saying, "I am sure you have probably taken all these quotes out of context because I met him and he is such a nice person." He is such a nice person?!? Caryl Matrisciana: I've met Brian MacLaren and he is a nice person. That's a deluding spirit. See, it's not who we speak to but what we are speaking to. It shouldn't be determined on an emotional level. The Bible tells us to test the spirits. We've got to test on the spiritual level, not the emotional level. That's what is happening with the new Emergent Church. It's plugging into emotions. Subjectivity feels as good as faith. It's only truth is not to be judgmental. Nathan Jones: Tolerance is the ultimate ethic now. Caryl Matrisciana: Tolerance is the ecumenical idea of embracing all religions. To achieve that you've got to break down all the denominations within Christianity in order to bring in the new one-world religion. Dr. Reagan: People say to me, "You really must be exaggerating what these people say." Well, at first they were rather subtle, but now in recent years I've noticed they have become very open. For example, here is a quote from one of the leaders of the movement, "My goal is to destroy Christianity as a world religion and be a re-catalyst for the movement of Jesus Christ." Caryl Matrisciana: A re-catalyst for the movement? Which Jesus? Dr. Reagan: Nobody knows what that means. It's mumbo-jumbo. Caryl Matrisciana: Remember that Jesus said in Matthew 24 four times that there is going to be religious deception in the last days. There are going to be false teachers in the last days. False teachers are going to come in the name of Christ. They are going to come in His name. His name is Christ. Here is a false Jesus Christ. So the Antichrist, why is he called Antichrist? Well, he's like Jesus. These false teachers have got to recondition the minds of everybody to think that this new Christ consciousness — this new Jesus Christ — is going to be something that we can all embrace, whether you are Muslim, Hindu or whatever it is. The big peace plan of a leading evangelical movement teacher today is all about bringing in global Christianity, global peace, and global ecumenical ideas. Dr. Reagan: So what you are saying is that this Emergent Church Movement is really just part of many different movements that exist which are designed to prepare the way for the one-world religion of the Antichrist? Caryl Matrisciana: Absolutely! It's the ecumenical idea of going into every denomination whether it is Episcopalian, Protestant, Reformed Theology, whatever it is, declaring that we all must come to a consensus of a new Jesus Christ, a new Christ consciousness. In the next part of this interview with Caryl Matrisciana on the Emergent Church, we'll ask her to define the Emergent Church Movement. all that I have felt in my spirit about so many you have spoken of today. God Bless you and I pray others will open their spiritual eyes and ears and hearts to the TRUTH. Revelation is happening as we 'speak'. The false doctrines are here now and deception is the norm. Thank you again and continue to reveal the lies of deceptions in our churches. Love in Christ.